The Purdy FFA Chapter received The MFA Oil Foundation Awards Grant on October 18th, 2018. 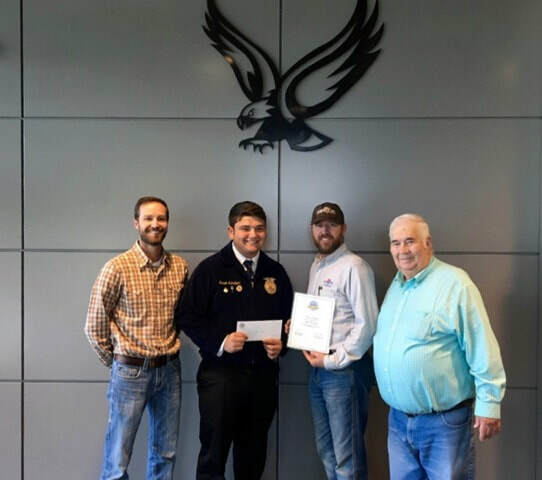 The grant, which will assist with the purchase of a new squeeze chute, was presented to Purdy FFA Chapter President Mason Schallert and Purdy FFA Advisor Jordan Ellis by Southwest Missouri State Board Member Ralph Schallert and the Manager of Neosho, Purdy, and Aurora MFA Oil Company Jason Bond. The MFA Oil Foundation provides support to non profit organizations that are working to improve communities where MFA Oil has a significant concentration of member and employees. Since it was established in 1998, the MFA Oil Foundation has awarded more than one million dollars in grants. The Purdy FFA wishes to extend its heartfelt thanks to the MFA Oil Company for allowing us to receive the grant. Pictured, from left to right: Jordan Ellis, Mason Schallert, Jason Bond and Ralph Schallert.